Blueberry season is officially upon us and although I’m still obsessing over Rhubarb (more recipes to come! ), blueberries are my favorite everyday eating fruit. Whether you buy them from a street vendor, at the grocery store, or pick your own at a farm, these healthy little juicy bursts of flavor are classic, versatile, and never seem to grow tiresome. I personally enjoy eating fresh blueberries by the handful but most people prefer them in or on a more substantive dish or dessert. One of the most obvious uses for blueberries – at least in baking – are blueberry muffins. I know what you’re thinking: “another blueberry muffin recipe, who cares” but this recipe is not just adapted from the “dean of American cookery,” it’s full of fresh blueberry flavor and cinnamon scented bread-like cake. I adapted this recipe from the James Beard Cookbook. This classic cookbook, with its many basic recipes and cooking instructions, rarely disappoints. Similar to my grandmother’s cookbooks, many of the recipes provide great bases for multiple variations. This muffin recipe, for example, could be altered for other berries and fruit and also spiced in many different ways (I plan to try cardamom next). 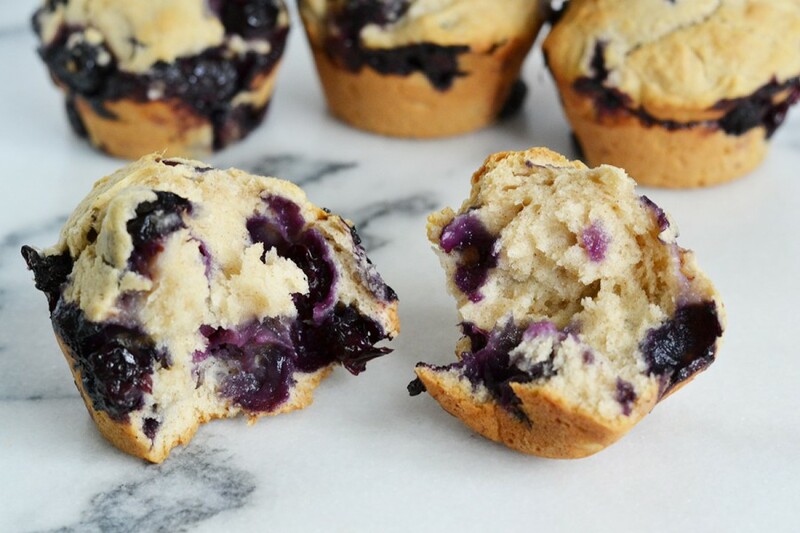 Berries and cinnamon are a scrumptious combo so by pumping up the cinnamon and increasing the blueberry content, this basic muffin became an even tastier treat. When you pull off a piece of the cinnamon spiced bready muffin, patches of warm fresh blueberries are displayed generously. Whether it qualifies as dessert or a breakfast bread (or both), this satisfying summer baked delight maybe the best way to eat blueberries – or at the very least, your daily serving of fruit. Preheat oven to 400 degrees. Grease a 12-cup regular muffin pan. Combine 2 cups flour, baking powder, sugar, salt, and cinnamon in a large mixing bowl. Combine the milk and beaten egg and mix with the dry ingredients. Add melted butter and blend thoroughly. Add the 2 teaspoons flour to the blueberries and stir or toss lightly to ensure blueberries are coated. Fold blueberries into batter. Fill each muffin cup 2/3 full of batter. Bake for about 25 minutes or until lightly browned and puffy. I don’t think one can ever have too many blueberry muffins, or blurry muffin recipes for that matter! Yours look great Megan! Love the addition of cinnamon and that these are more bread-like! Yum! You can never go wrong with the James beard cookbook (or a grandmother’s! ), so I’m sure your adaption tastes wonderful! Thanks for sharing the yum and cheers! I wouldn’t have thought of putting cinnamon in blueberry muffins. It sounds delicious. Thanks! Love the name of your site.